The band as Logan Hicks sees them. The Bay Area punk rockers are expanding their artist pallet from the music and theater to galleries across the world. 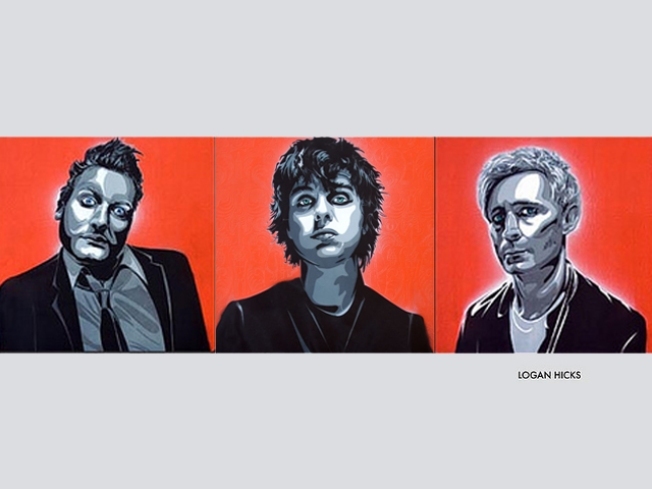 The three man band recently teamed up with New York City-based stencil artist Logan Hicks to create a traveling street art show inspired by Green Day's latest album "21st Century Breakdown." The band asked Hicks to put together a team of artists to produce artwork inspired by each track on the album. The art of course features a graphic piece of the three members of the band as well several cryptic and unique collages. Each piece is modeled after a track on the album but none of the art was actually inspired by the band's sound. "I wanted the piece to be a response to the lyrics, not the music," Hicks said in a recent interview. "So the majority of the artists got the lyrics before the album was even released. That way they only had the words to go on. I just feel that sometimes the music can skew the perception of the song. "Especially with Green Day, their lyrics can be a bit acidic but the melodies are a bit poppy. I wanted them to focus on the content, not the presentation so it was a truer interpretation of the song." For front man Billie Joe Armstrong, the connection between Green Day's punk rock lyrics and street art was a no brainer. "Many of the artists Logan has chosen show their work on the street, and we feel a strong connection to that type of creative expression,” Armstrong said. The artwork is currently being exhibited at the Old Truman Brewery in London and it will travel with the band as they continue their tour across the world.